SEOUL, April 27 (Yonhap) -- Samsung Electronics Co. said Thursday it has posted a net profit of a whopping 7.68 trillion won (US$6.78 billion) for the January-March period, marking its second-highest quarterly performance, with market watchers suggesting an even brighter outlook for the remainder of 2017. The South Korean tech giant saw its net income shoot up 46.29 percent on-year in the first quarter, helped by the strong performance of the global chip industry. Its sales also advanced 1.54 percent on-year to reach 50.5 trillion won over the cited period. The operating profit, which came to 9.9 trillion won, was also the second-highest figure ever posted by Samsung on a quarterly basis. The robust performance was mainly attributable to the sound returns from the computer chip business backed by an industrywide boom. The semiconductor sector accounted for 6.31 trillion won of Samsung's first-quarter operating profit, up 3.68 percent on-year. It marks the highest performance ever posted by the chip sector. Industry watchers said while the chip industry is anticipated to remain sound for the remainder of 2017, the improved returns from Samsung's smartphone business is expected to provide an extra push to its earnings down the road. Samsung faced a major crisis last year due to the suspension of the flagship Galaxy Note 7 smartphone amid reports that some of its devices caught fire while charging. The event not only dealt a harsh blow to its sales of premium smartphones, but also to its brand reputation. For the first quarter, Samsung's smartphone business managed to post an operating profit hovering slightly above 2 trillion won, marking a 1.83 percent drop from the previous year. The South Korean tech giant attributed the decline to the falling price of the nearly one-year-old Galaxy S7 ahead of the official release of the Galaxy S8 and the Galaxy S8 Plus. Samsung has been struggling to promote the Galaxy S7 to recoup losses from the ill-fated Galaxy Note 7 smartphone. Considering such difficult circumstances, industry watchers said the first-quarter report of Samsung's smartphone sector should not be considered a disappointment. The company is estimated to have sold 9 million units of the Galaxy S7 smartphone in the January-March period alone. The company also released various budget-line models to grab a wider range of customers. Samsung is anticipated to show a full-fledged recovery of its smartphone business in the second quarter as sales of the Galaxy S8 and the Galaxy S8 Plus kicked off in earnest last week. The devices feature high-resolution displays that bend at both edges and come with various innovative technologies, such as iris and face recognition scanners, and a smart voice assistant called Bixby. Industry watchers said Samsung may sell as many as 20 million units of the Galaxy S8 series in the second quarter. Although there have been complaints that some screens on the flagship device have an unnaturally reddish hue, industry watchers said the sales of the Galaxy S8 models still beat their predecessor. Industry watchers, however, warn that Samsung may face limits in improving the performance of the mobile business as the production cost of the Galaxy S8 is estimated to be 350,000 won higher than the Galaxy S7, which will invariably lead to a smaller return for each device sold. U.S. tech giant Apple Inc. is also set to release a new product later this year, which may compete with Samsung's flagship devices. Shinhan Investment Corp. said Samsung is expected to compete head on with Apple's next flagship using the upcoming Galaxy Note 8 phablet, as the recently launched Galaxy S8 will be several months old when the new iPhone reaches consumers. "If Samsung successfully launches the next Galaxy Note 8, it can recoup the brand reputation tainted by the Galaxy Note 7 and expand sales of premium smartphones," Choi Do-yeon, a researcher at Shinhan, said in a report. "Samsung is expected to seek an early release of the Note 8." Samsung, the world's No. 1 player in the chip industry, is also anticipated to rake in strong earnings for the rest of this year. "In DRAM, with the expansion of new server platforms in the market, demand for high-performance server DRAM over 64GB is forecast to increase," the company said in a release. "New mobile device launches and adoption of higher density DRAM in the second quarter will increase demand for mobile DRAM. Samsung will remain profitable with high performance, high value-added chipsets," it added. Samsung also highlighted the overall supply and demand in the memory market will be stable amid peak seasonality and new mobile devices being released in the market for the second half of 2017. Industry tracker Gartner earlier said the size of the global chip industry is expected to grow 12.3 percent on-year to reach $386 billion in 2017. 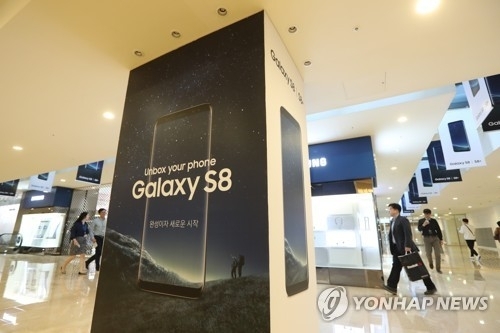 Reflecting this, Samsung Electronics' second-quarter operating profit is currently estimated at 12.2 trillion won, according to the survey conducted by Yonhap Infomax, the financial arm of Yonhap News Agency on 21 South Korean brokerage houses.